This page contains notes and handouts for the 12 Step Big Book workshop on AA's 12 Steps, as presented by Dallas B. This is handout #1 for the 12 Step Workshop. 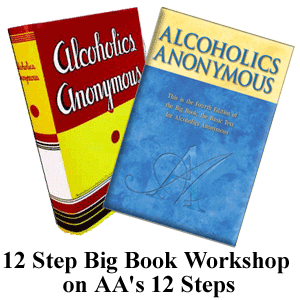 For this workshop to work -- we need to take a look at What Alcoholics Anonymous is -- AND what the 12 Steps are FOR and WHY we need to TAKE the Steps BEFORE we can start working the 12 Steps! The majority of answers that you'll hear is "It's the Fellowship of Alcoholics Anonymous." Next, you'll hear "It's the Meetings." Or, "It's the Organization as a whole. "e; And, sometimes you'll hear: "It's the Members of A, the Fellowship, and the Organization of Alcoholic's Anonymous." While all of this can be considered as true -- it's also misleading, confusing, and can get a new A member started out on the wrong path, with some cloudy conceptions of A. The "The Path?" Yes. The PATH mentioned on page 58, of the book Alcoholics Anonymous -- "How it works" which is briefly read at the beginning of most A meetings. The page that starts out with: "RARELY HAVE we seen a person fail who has thoroughly followed our path." You know. Nowadays, they would say "Bill! Don't write those two words in all caps -- or people will think you are YELLING at them!" (LOL). I think it's right on! It seems to need to be yelled -- because not many ears seem to be hearing it -- when it's gently read at the beginning of each meeting! Currently, in meetings -- they might as well read, "RARELY HAVE we seen a newcomer stay sober without slipping a bunch of times -- before a select few of them finally get it! But, no. That's NOT what we'll hear. We will hear really dumb crap like "Oh. Well. That newcomer must not have wanted it enough." Or some dumb answer like this! YES, the newcomer wanted it -- they were just unable to find it when they came to the A Meeting looking for it! They were told more dumb things like "90 in 90 pal! (referring to 90 A meetings in 90 days) -- Keep coming back!" Then, when the newcomer slips -- or relapses, and if they live to return, you'll hear: "Well. I was working the program and then I stopped going to meetings. And, we know what happens when we stop going to meetings -- the meeting makers make it and those that don't make the meetings don't make it!" So, what happens then? Another slip. Another relapse. We may even hear of another unfortunate suicide or some other fatal end to the newcomer's journey within our walls. This is tragic. In most cases, I don't believe the newcomer even had a chance of making it. They came looking for information. They came to A looking for help. Initially, they wanted to quit drinking and recover. Often, they had already hit their bottom and were experiencing pitiful and incomprehensible demoralization. Maybe they were already facing the divorce lawyer. Or the wife left. Or, they got the warning notices on the job -- Or, the judge sentenced them to A and they THOUGHT they were coming to "find the classes!" But, they were given incomplete and confusing, misunderstanding and wrong information. So, let's say they came back after relapse. And, they heard the same thing again: "Meeting makers make it -- and you stopped going to meetings, so you relapsed." Here's the problem. The Official A Plan of Recovery -- Is NOT the meetings! I don't care if you attend a gazillion meetings -- there is NO recovery going to get to you as a result of sitting in a chair in a million A meetings! That's NOT "HOW IT WORKS"
You won't find the word MEETINGS in Chapter 5, of the Big Book. And, as a matter of fact -- you won't hear anything in the book about meetings -- until you get up to page 159, the last chapter -- in A Vision For You! A VISION FOR YOU -- is the last Chapter in the book. Actually, if you are TAKING the 12 Steps -- as described in the book -- you will have ALREADY taken all 12 Steps -- BEFORE you get to them talking about meetings! The word SPONSOR, originated in A, to designate the A Member, who would vouch for the Newcomer -- and say "I witnessed him make the surrender! "e; (Read the books: A Comes of Age and Dr. Bob and the Good Old timers, where they mention this specifically). The Official Plan of A Recovery -- is NOT the Fellowship or the members. Yes. A does have a "Program" -- other than going to meetings and trying to work and live by the 12 Steps. That newcomer -- that used to come to Meetings -- might be sitting in a bar right now, or standing in front of a judge, and saying "Well. I tried A, and it didn't work for me." Or, that newcomer (or, Old-timer) may be six-feet under, and left not knowing that A really does have an Official Plan of Recovery -- IN the book, and that they could have recovered! They could have gotten well -- before the last curtain was closed on them. I don't have time to give the HISTORY of A Workshop here, today. So, we'll have to cover this at a future time. Until then -- STUDY your A History! First -- Ebby Thatcher (the man Bill, referred to as his sponsor) came to see Bill W., and gave Bill some ideas regarding a possible means to recover. Bill "thought" that Ebby was talking about getting religion. (Going to meetings at the Oxford Group). And, working a simple formula they had, to surrender: Repent. Confess your sins. Make restitution. Testify (witness) to others. And, go to more meetings! The problem was: It didn't work for Bill! They tolerated Bill, until he got drunk and started preaching in their meetings! They were going to throw him out! Bill, got real drunk and ended up at Townes Hospital, under the care of Dr. William D. Silkworth, to dry-out. Bill had already heard Dr. Silkworth, tell his wife Lois, that Bill was going to either drink himself to death -- or have to be locked up. Ebby came to see Bill, in the hospital. Bill had tried the simple formula that Ebby had given him PLUS something more. Bill had become AWARE of the true nature of his condition. He was hopeless, unless some miracle happened to him. He prayed and something happened to him. He wanted Ebby to bring him a copy of the book Varieties of Religious Experience, by William James (a book referred to in the Oxford Group). Bill wanted to read the book and try to figure out what had happened to him -- so that he could hang on to it! Bill, later, sitting at his kitchen table, worked out the formula with Ebby, which had been given to him at the Oxford Group. (This formula, would become a PART of what was to become the 12 Steps). Bill, got the idea that he needed to "testify and witness to other alcoholics" -- to help them get sober -- as the means, to keeping him sober. Dr. Silkworth, gave Bill, the information that Bill needed, to complete his FIRST STEP (and, what would later become part of the 12th Step of A). (The First Step -- information from Dr. Silkworth, made the difference! This was later confirmed by Bill, in a letter that he wrote to the famed psychiatrist Dr. Carl Jung -- who had tried to help Bill's friend -- Roland Hazard, to get sober and stay sober. And, Roland, was the man who carried the message to Ebby, who then carried it to Bill). When people say that A started within the Oxford Groups -- our history of A, shows this to be WRONG. It actually started with a Psychologist, William James, who gave lectures, that influenced a Psychiatrist, Dr. Jung, who then tried to use the information on Roland Hazard. But, after a year of working with Roland, Roland, got drunk. And, Dr. Jung, pronounced him as "hopeless." So, the more accurate HISTORY of A, would be: 1. It first started with a Psychologists lecture. 2. The lectures were written in a book. 3. Dr. Jung, a Psychiatrist -- used the info on Roland Hazard. (An Intervention? I believe so). THEN, Roland, went to the Oxford Group, to try and find religion. For nearly six months, Bill stayed sober -- by trying to help other alcoholics. He was unsuccessful in helping them -- but he was successful in staying sober. At six months sober, Bill went on a business trip to Akron, Ohio. The failed results of the business trip had Bill on the brink of a drink -- which Bill, knew would lead to a drunk. Bill, realized that HE MUST find another alcoholic to try to help -- or he would get drunk. Bill, thought that the best way to find a drunk to help would be to try and contact a Minister -- who was trying to help a drunk that wanted to be sober. Dr. Bob, had already tried religion. He was a star member of the Oxford Group in Akron -- but, he couldn't get sober nor stay sober! Dr. Bob, thought Bill, would be another nitwit coming to preach to him, but he was wrong. Bill, told Bob about his experience and how he had been sober for six months -- by trying to help other alcoholics. Bill, told Dr. Bob, what he had learned from Dr. Silkworth, about the nature of alcoholism. That it was an illness -- not a moral problem. That it was a condition of mind -- and -- body. A physical abnormality in the body of the alcoholic -- which is why the alcoholic can not have so much as a sip of a drink, and expect to maintain sobriety. A phenomenon of CRAVING would kick in -- IF the alcoholic drank any quantity of alcohol in any form. Furthermore, that on top of this -- the mind of the alcoholic, has an obsession, that will drive him to taking the next drink. And, a form of alcoholic insanity -- that would keep the alcoholic from realizing that "One drink is too many and one million drinks will not be enough -- after the first drink!" So, the Treatment, that Bill discussed with Dr. Bob (to sum it up) was: 1. Absolute total abstinence from alcohol. (Not even near-beer would be safe!) That would take care of the physical part. If no alcohol was put inside the alcoholic body -- the phenomenon of craving would not be a problem to deal with. 2. By trying to help other alcoholics -- it would help the sober alcoholic remember his OWN condition, AND thereby remind him that he is Powerless (physically) AFTER the first drink. HOLD ON THERE IS MORE TO IT!!! 3. The Alcoholic is STILL POWERLESS OVER THE NEXT FIRST DRINK -- EVEN WHILE SOBER -- because of the "insanity of alcohol-ism" -- the obsession of the mind, that will refuse to tell the truth to the alcoholic! 4. So, an AWAKENING must take place inside the brain of an alcoholic. (Which will be produced by what we now know as the 12 Steps -- to create the "conversion experience" -- referred to by William James, Psychologist, and Dr. Carl Jung, Psychiatrist). 5. The alcoholic suffers from a severe case of "twisted thinking" (Insanity: the inability to see and know and realize the truth, at all times, in regards to alcohol). 6. And, as we now know (as Bill, later discovered) -- the alcoholic has an unhealthy thinking-system. And, this unhealthy thinking-program inside the mind of the alcoholic -- creates tremendous sensitivity, in regards to "emotional well-being." The alcoholic is very childish. Narcissistic. Defiant. And, becomes uncomfortable (to say the least) -- to miserable -- WITHOUT alcohol! The alcoholic has been self-medicating with alcohol because of the tremendous discomfort and dissatisfaction with life while physically sober. our crowd now shows any mark of dissipation." "To get over drinking will require a transformation of thought and attitude. We all had to place recovery above everything, for without recovery we would have lost both home and business." a. We need to take care of our body. b. Often, we may not recover overnight. c. Nor, do twisted thinking and depression vanish in a twinkling. d. A spiritual mode of living is most powerful for restoration. f. We have seen remarkable transformation in our bodies. g. We've got to have a TRANSFORMATION of THOUGHT and ATTITUDE -- IF we are to stay sober! h. This is NOT going to be a result produced from -- sitting in meetings! i. ACTION and MORE ACTION is what is going to be required! WHAT IS THE PURPOSE OF THE 12 STEPS? 1. Read, Step 12. The purpose of the 12 Steps is to bring about a transformation -- an AWAKENING, A psychic change. 2. Next, I ask that you read the appendix in the back of the Big Book, titled "Spiritual Experience." It doesn't do much good to think about what a Spiritual Awakening or a Spiritual Experience are -- IF we're not on the same page in understanding what they are! c. It was all trial and error up to this point. d. They didn't have a NAME for their Fellowship. e. They decided to write a book. f. They named and title the book: Alcoholics Anonymous. g. It's the PRECISE instructions that they suggest -- because they tried it all, until they found what worked! i. By the time that the book had been written and published -- Bill W. had now been sober for 3 1/2 years! Now, let's get back to the 12 Steps. Notice something I wrote above where I referred to page 143, and read my talking points for those! Point to Ponder here -- in regards to the mention of twisted thinking and depression not going away overnight. If you'll take the time to read the Big Book, Bill's Story -- He got well pretty fast! He experienced an incredible transformation while in the hospital! The depression had left -- when he had his Spiritual Experience in the hospital! Bill often refers to his emotional state back then, as feeling as though he was walking hand-in-hand with his Creator! That doesn't sound too depressing to me! But, we also know that Bill went through many years of suffering with depression! What happened? Why did the depression return later? From my studies and from my personal experience -- I believe that the answer to this is: because he stopped doing some of the things that he was doing -- that kept the depression at bay -- and when he stopped taking those actions -- like a magnet the depression returned! My experience has been: Thinking can TEMPORARILY change my actions. But, the actions don't last very long. However, ACTIONS can change my thinking -- and this change in thinking does last for a long time! IF I continue taking the actions that is changing and keeping my thinking changed! WHAT IS ALCOHOLICS ANONYMOUS? It's the book! (And, a Fellowship named itself after the book). ALCOHOLICS ANONYMOUS IS: The 12 Steps -- that PRODUCES 2nd Fellowship within the Fellowship of Alcoholics Anonymous. Did you know that there are TWO fellowships IN A? It's explained in Chapter 11, A Vision for You -- on page 164.
a. The Fellowship of Alcoholics Anonymous is members. They don't even have to be sober to be a member of this fellowship! All they need is a desire to stop drinking -- and to say that they are a member. These are the majority of the Fellowship that you'll find in the meetings. Yes. Most of them are sober. And, you could call many of them "the meeting makers" -- they often go to many meetings. b. The other Fellowship (read it for yourself on pg 164) is: THE FELLOWSHIP OF THE SPIRIT! The 12 Steps: This IS the Program of Recovery. This IS the Official Plan of Recovery in the book. The Big Book of Alcoholics Anonymous is the basic text of Alcoholics Anonymous. The Fellowship of Alcoholics Anonymous is the A.A. Members. II. What are the 12 Steps? Big Book, Page 25: "... the simple kit of spiritual tools .."
The 12 Steps are 12 Spiritual Principles, that members of A.A. use to recover from alcoholism. 2 Spiritual Principle = a "Life" Principle = "A basic truth, rule or law concerning the functioning of natural phenomena or mechanical processes." 3. Spiritual Principles = "Basic truths, rules or laws concerning the functioning of life’s natural phenomena and mechanical processes." a. Remove the mental obsession with alcohol. n. And, much, much more. 5. Can the 12 Steps be applied to other problems? Over 300 fellowships (Other than Alcoholics Anonymous) with unique problems have adopted the 12 Steps as an application and solution to their own unique problems. Does an A.A. member need to join other fellowships to use the 12 Steps for other problems? That would be a personal and individual choice of the A.A. member. I personally have not had to join any other fellowships, even though I may have qualified to join them – and I have successfully used the 12 Steps to address the other problems in my life. For myself, I prefer to keep my personal recovery within A.A., and specifically in the Big Book. (My life depends upon it). The A.A. fellowship is large enough that I can always find someone in A.A. who can assist me, who had the same problem that I had, and they can share with me how they got to the other side of the problem -- through A.A.'s way. I would be concerned that by going to another fellowship, other than A.A., that their solution may cause me a problem with my A.A. solution. Their application of the 12 Steps, as they understand them, may be directly opposite to what the Big Book of Alcoholics Anonymous instructs me to do. (Example: to be a victim rather than to take responsibility and to discover my part in a situation, or to see what I could have done differently). While it may not be appropriate to discuss my "other problems" in A.A. meetings... that doesn't prevent me from discussing the problem with my sponsor, and asking his direction and guidance, and it doesn't prevent me from discussing the problem with another A.A. member individually. If my sponsor did not have experience with the problem that I have, I'm sure he would know someone in A.A.'s fellowship who successfully solved the same problem using A.A.'s solution to solve the problem that I would need to solve. I have heard people say "A.A.'s method is too shallow to solve all my problems." Those people are often the same people who think that A.A.'s "solution" is meetings and the fellowship. While meetings and the fellowship are important elements in recovery... they are not "the solution" and they are not "the recovery program of A.A."
The solution is the 12 Steps. 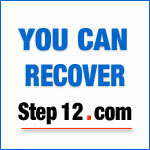 The Recovery Program of A.A. is the application of the 12 Steps as described in the Big Book. The meetings and the fellowship is to remind us of two things: 1. What the problem is (Powerless). and, 2. What the solution is (the 12 Steps). Without the meetings and the fellowship, I'll begin to think that the problem is anything other than Powerless. And, I'll forget what the solution is... the 12 Steps... and come up with all sorts of solutions of my own. In A.A., we call that "stinking thinking" and as alcoholics, we cannot afford the luxury of "stinking thinking" because stinking thinking produces "stinking results." As an alcoholic, it's vital that I find a way to be happy.... and sober, or I will drink again!!!! That's the purpose of the 12 Steps. If you've been in or around A.A. for a while, and you are not happy, or if your results "stink".... YOU'RE DOING IT WRONG!!!! Remember, Principles work the same all the time, for anyone, at any time... regardless if it was 100 years ago, today, or 100 years into the future. Principles always produce the same results.... IF they are applied the same way. That's what it means, when, at the end of some A.A. meetings, they say "It works if you work it." If you work the principles they will produce the same results for you... that they produced for me and countless thousands of others...... "A happy, useful, peaceful, contented, satisfying, purposeful, and successful life... without alcohol"! 6. What does it mean to apply the 12 Steps in all our affairs? It means to "apply the 12 Steps in all areas of my life." Emotional ambitions = my sense of emotional well-being. Social ambitions = community, world and personal relationships. Material ambitions - " Pocketbook " = health, finances, material possessions, employment, job, business. Spiritual ambitions = my understanding, relationship and conscious contact with my Higher Power. NOTE: The above information is an individual's perception and experience and should not be considered as Official A.A. Literature and should not be interpreted to be an official view, suggestion, opinion, etcetera, of Alcoholics Anonymous. Much of the information is from an A.A. 12 Step Study Workshop, that's presented by Dallas B. It was both -- transcribed by tape and also from his personal writings. We hope to make more of the handouts available on this website. Check back for updates. If you have questions, contact us.